Harbor Island sets between Shelter Island and Downtown San Diego CA. on San Diego Bay. It is really a peninsula and not an island since it has a narrow connection to the mainland. Harbor Island is about 2 miles long and only a few hundred yards wide that was originally created from harbor dredgings to deepen the channel for larger naval super-carriers. The Island has but one single road, Harbor Island Drive that runs from the mainland to the entire length of the island. It is located directly across from San Diego Airport making it a convenient place to relax while waiting for connecting flights. The island's environment and views of San Diego Bay are equally beautiful to its sister island, Shelter Island. Between the peninsula and mainland are several marinas that harbor several thousand sailboats. Harbor Island Park is located on the island which is nice viewing point for the sea-going traffic. There are two luxury hotels with excellent amenities and restaurants on the island including the Hilton San Diego Airport and Sheraton Harbor Island. They have charming restaurants open to gentle breezes across the marina that embellish the vacation experience. 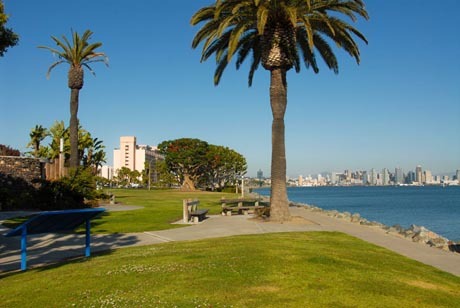 Harbor Island park area affords visitors an expansive view of Bay activities. Harbor Island features a shoreline path for walkers and joggers and a route for bikers. Maximum occupancy for events is 200.